Hey guys. 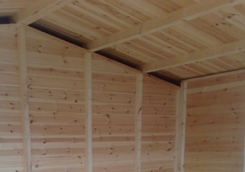 I am looking to soundproof a wooden shed to use as a small recording studio. I'm looking for an affordable method, therefore I am not expecting to make the shed 100% sound-tight. I'm looking to soundproof the four walls and roof, altogether I will need 50 cubic meters of material to cover those surfaces. The walls look to be pine and about 1/2inch thick. I have filled in all holes including the structural gap surrounding the door. Really i'm looking for some advice on what you would suggest to use as my material. I'm setting my budget to around £150 (about $300) if that helps. Re: Looking to soundproof a garden shed as a small recording studio. Based on the budget you have set, the best advise I can give you is to use multiple layers of 5/8" drywall or cement board(hardy backer) for 2 inner layers- caulking every edge of every sheet on each layer except the last and offsetting the seams of each layer. Hey buddy, thanks very much for the advice. I hate to be a pain, but could you explain your suggestion in a bit more detail? I'm not really sure what techniques you are describing there. So far I understand that drywall is the best bet, and that 3 layers of 5/8" would do the job. the technique is known as buttering the edge. You will apply acoustical caulk bead to the edge of every sheet before the next sheet is installed.wipe clean while wet. or you can caulk the seam after drywall is hung but be careful not to create a high spot with the caulk because it can cause problems for the remaining layers. All you are really doing here is a mass value due to budget restraints, however being sealed air tight will be a major factor in the results. Ok I think it would help if I could see the materials you're talking about, specifically this acoustic bead thing. Is there a UK distributor with these materials that you would suggest? Im sure they will also be able to advise you on its use. Thanks alot buddy, i'll let you know how i get on. Hey buddy, sorry to bother you again. I couldnt find any drywall on that website link you posted. I did however find this product, would this do the job using the technique of three layers sealed with the acoustic sealant? Yes, that appears to be your version of drywall(sheet rock). Im not an expert on out of the country materials but from what I see from the link it is what you should use. Now note the comment listed on their site. "PLEASE NOTE THAT THIS PRODUCT ON ITS OWN IS NOT ENOUGH TO SOUNDPROOF A WALL OR CEILING. IT NEEDS TO BE USED WITH EITHER OUR RESILIENT BAR OR M20AD SOUND INSULATING MATERIALS." This is known as decoupling from the structure and is the most effective form of sound reduction along side of mass value. Your budget might need to be reconsidered in order to achieve quality results. For the channel, we always recommend using some form of decoupling to achieve a better end result. With that being said you must find out the limitations of the channel. ex: RC-1 (the link you provided) we use for walls only, starting at the floor building up. This method will allow you to use 2 layers sheet rock. Building from the top down will only allow single layer drywall. Weight of wall is actually on vibration pads. which you can see on this link. RC-2 is for ceilings and holds 2 layers of sheet rock. as seen here on this example. Ok brilliant. Starting to build a picture of how this will all work out. I've watched a few videos on that method of using the resilient bars to decouple the soundboard, and they all show a gap between the floor and the soundboard, as does the image in the link you posted. Will the gap not cause a problem? On that note also, If I use the RC-2 bars for the roof, will I need to leave a gap between the panels attatched to the roof to the ones on the walls, or should they be air tight? You are correct, Floating requires a gap around the perimeter which is to be filled in with acoustical caulk. Try to limit this gap size 1/8" - 1/4" , the larger the gap the harder to fill completely.Do not hard mud or tape corners (finish caulk while wet) you can only tape and mud the field. Make sure the outer shell is caulked as well before you begin adding soundproofing materials in the wall. The room will be air tight because you will be caulking like this is a fish tank (water tight). When the door opens and closes you should feel a difference. One final question before I purchase the materails. Is there a product that you would suggest for the gaps that will be created in the dryboard for the door? Something like the caulk that will keep an airtight seal when the door is closed, but only stick to the edge of the dryboard on the door? Or would it work to put a piece of paper on the edge that meets the wall, close the door, then when the caulk dries remove the paper? refer to this link for the basic concept to soundproof a door.